Ever have a day where you knew you could go one way or the other? I woke up this morning actually thinking I might be coming out of the cycle of whatever this is that is ailing me. The disease which has yet to be identified is definitely cyclical. What precipitates the cycles has yet to be determined but seriously, if I knew I would feel as bad every day as I have felt for the past two months I don't know what I would do. And although good days seem to be more and more rare when they do arrive it is enough to make me what to dance for joy, something like a funky cross between Snoopy and a prohibited touch down dance, you know? Today I got up and realized I had forgotten to give myself my weekly vitamin B12 injection. Part of my physical problem is a failing immune system. My body cannot synthesize B12 from the food I eat. It's an easy fix, but for some reason I forgot that yesterday was Manic Monday. I call it that because the lack of energy I have stems from having pernicious anemia and getting a boost with B12 reminds me of the manic phase of bipolar. No, I am not bipolar, I just have a degree in psychology. Anyway, I can leap buildings in a single bound when I have some B12 on board. I realized I was dragging and hadn't given myself the shot. So I went into the bathroom to take care of business. When I pulled the syringe out and popped off the cap that protects the needle I couldn't help but notice that it was bent. Right angle bent. How it happened I don't know but it did and it was useless. Fortunately I had others. Next I went out with the dogs and the first thing I saw while making our walk around the property was a dead bluebird. Yuck. No gloves, no implements, no luck keeping the dog from rolling on it before I could give him or her a burial. Blue birds shouldn't die. They are supposed to be happy, right? Nothing happy about maggots and insects reclaiming a bluebird body. Fascinating maybe, but not happy. Back in the house to wash up and then take some movies back to Blockbuster before the heat indices hit their predicted target. Yes I said it, returning movies to Blockbuster. Sounds positively medieval, doesn't it? I wanted to see if upgrading Netflix to bluray was worth it or not, and for me, it's not. I digress. On the way to Blockbuster a fledgling starling tried a kamikaze run at my little RAV4. He was unsuccessful but I had to drive away with him sitting in the middle of the road wondering what in the world had just happened to him while his parents scolded him mercilessly. Pressing on I decided to believe that the starling survived other cars and predators. I don't even like starlings but I like the thought of dead baby ones even less. Determining to think of other things while I drove into town a red flash caught my eye. It was a cardinal and he was chasing some other bigger bird with the help of his mate. Sweeping, diving, swirling, sort of like a dogfight. Suddenly they changed direction and somebody was bouncing across my windshield. Great. First the bluebird of happiness dies and then the cardinal of vexation gives his life chasing off an intruder. 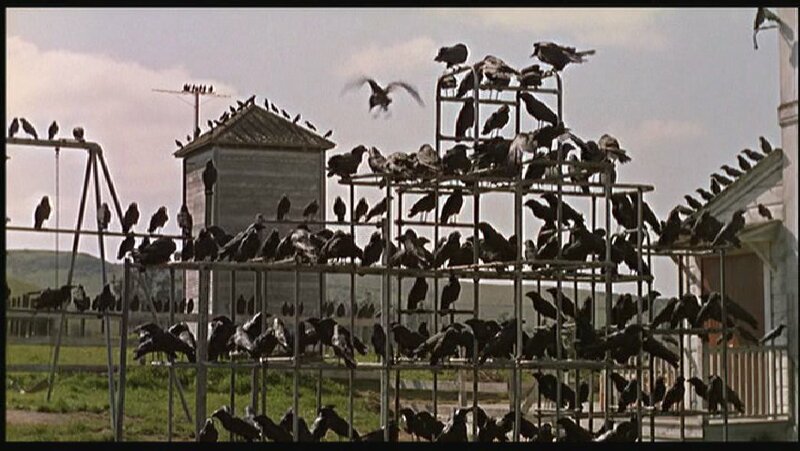 This day is starting to feel like a sequel to The Birds. Wonderful. Now I am homesick. 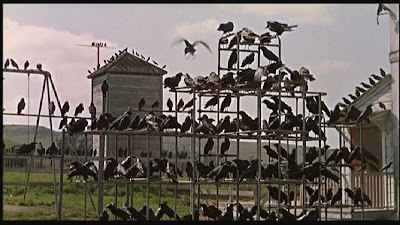 I grew up where they filmed the birds. Remember the scene at the schoolhouse? I used to take visitors there and wait for them to recognize it and say something about the movie. Hitchcock was a master at scaring the life out of you with noise. No bird as ever made the noises those birds did but there was no doubt those birds were going to kill someone when you heard the noises they made. Back here in Kentucky these guys are bent on self destruction it seems. Poor cardinal. He may have survived the crash, right? The question is, am I going to survive this day? Probably. I give it a 50/50 chance. I either will or I wont. No sense fretting about stuff I can't change. Besides, I don't look a thing like Tippy Hedren so it's all good.